I have been DYING to announce this! 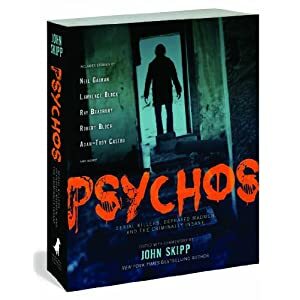 My story “Murder for Beginners” was accepted for John Skipp’s Psychos: Serial Killers, Depraved Madmen, and the Criminally Insane. Isn’t that fantastic? You know what is even cooler? This TOC. Check it! I die a thousand joyful deaths. Hooray! That’s awesome news! Love that story 🙂 And that’s one hell of a group of authors. Can’t wait to check out the book. Congratulations, Mercedes! That is quite the list of authors. So glad to be under the covers with you, Mercedes! You, lady, are no slouch. This isn’t the first time you been right up there with the big playas. I am not surprised. w00t! Now get a novel out there for us to enjoy! Thanks so much, everybody! I’m just beyond thrilled. I was also excited because my story is a reprint, and Skipp came up and asked if he could use it for the anthology. It was my first experience with somebody specifically requesting a reprint, and I was all abubble. Congratulations Mercedes! That’s a fantastic TOC and to be approached to include your reprint – awesome! You deserve it.